It’s always refreshing to find a place that lives up to the hype, and Tartine Bakery qualifies. One of my North Carolina food-writing friends was visiting California (check Kristen out at GadaboutFood! ), and she invited me along to try this small bakery in the Mission District that has made a million top ten lists for the Bay Area. It’s so well known, it doesn’t even need a sign. You know you’ve hit the right corner when you see the line queuing out of the black shop. Kristen and her friend John beat me there, so I didn’t even have to wait to get food, but the line wasn’t too bad on a Thursday morning at 10—took them about fifteen minutes, I think. They snagged some table space in the elbow-room-only dining area, and I arrived to a feast of a little bit of everything. And it was all really, really good. 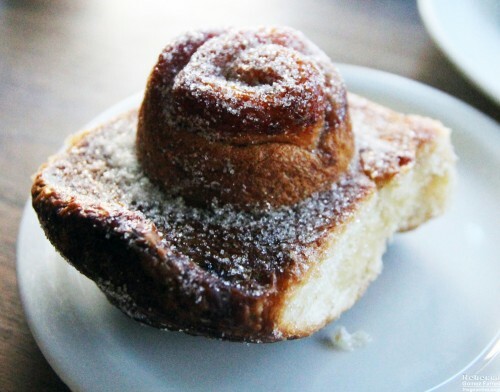 The morning buns are the most hyped of Tartine’s baked goods, and for good reason. The whole bun is dusted in sugar. It features wonderfully crunchy edges and a bottom soaked in a faintly orange syrup, which creates a hard coating that was too hard in a few spots. But once you taste that butter soaked into the morning bun’s layers, your appreciation for it can only deepen. Next up? Biscotti and a chocolate croissant. I appreciated the anise hint to the biscotti, but the amazing dark chocolate made the croissant a star. 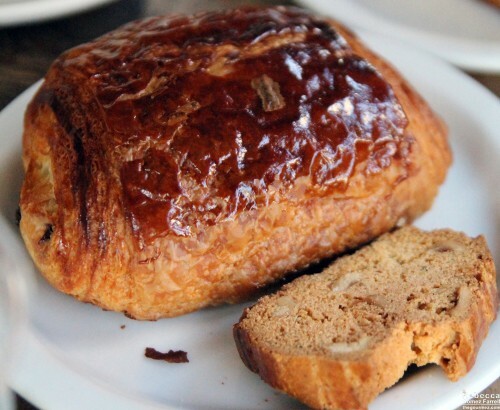 You could taste the berry qualities of its cocoa, and the croissant pastry itself was excellent. 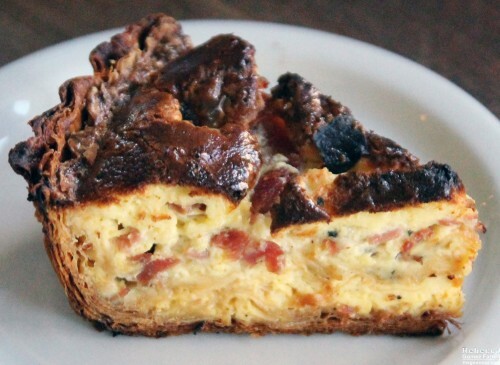 The quiche’s crust was exceptional, if a touch too browned. My fork dove down to find it breaking apart into buttery layers like phyllo dough. The quiche filling had a nice tang, and I appreciated the thick, tall slices. 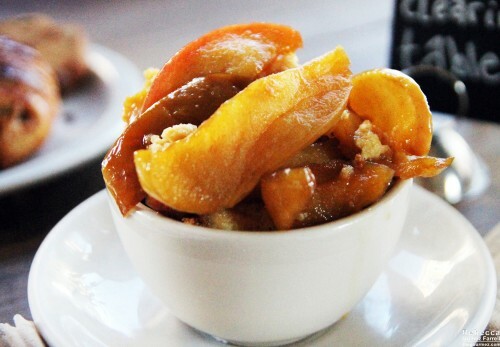 The peach bread pudding paled only in comparison to everything else we tried. It’s a custard bread pudding, reminding me strongly of scrambled eggs though quite sweet. The peaches’ juice infused the custard, but I prefer my bread pudding on the dry side. I would prefer everything I eat to resemble their croque monsieur. Definitely the most creative and delicious take I’ve seen on this breakfast standard. Every bite of my wedge made me so happy. The sourdough was some of the best I’ve had and stood out for its fluffiness. On top of the bread came a béchamel so good, you’d be tempted to never call it white sauce again. It was simmered with caramelized onions. On top of that was thin ham, sundried tomatoes roasted to a creamy consistency while maintaining their bite, and melted cheese. I will happily eat it again. And again. And again. The only drawback to Tartine Bakery is that eating inside is a madhouse. It’s a small space made all the smaller by the line of people waiting to get their own goodies from the bakery case and those hoping to snake a table with their goodies in hand. Heading behind the counter to bus your own tables is also awkward. So while I think Tartine is an essential foodie destination for the Bay Area, I’d recommend taking your order to go as a vast many of the patrons did while we were there. Also, add the banana cream pie to your list, because those looked absolutely amazing. We were so sad we hadn’t chosen it, but I’m not sure any one of us could have eaten a bite more. Who am I kidding? We’re foodies. We can always eat more. Simone Chavoor loves this place! So glad you made it to Tartine. It’s amazing!!! Personally, I always go for the ham and cheese croissant, but I’m more of a savory girl. You really can’t go wrong with anything there though. It’s that kind of place. It’s great! Thanks for the invite, Kristen Baughman. 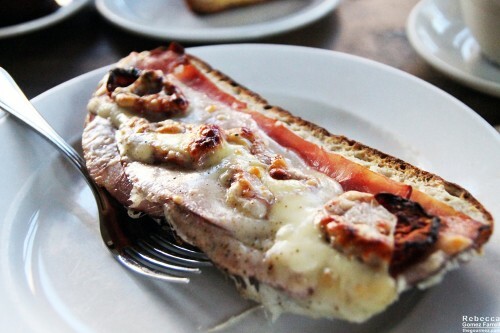 And the Croque Monsieur was excellent for the savory side of things, Brandi Howell.